Learn Magic: Zippy!Learn Magic: Zippy! This favorite is a fun routine to perform! Want to learn to do this one? Pretty good that you can create a lot of fun with a sandwich bag used for picnics! Speaking of picnics, are you planning a company, church, or family picnic? 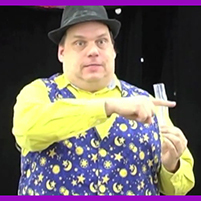 Let Abra-Kid-Abra add laughter and fun with great picnic entertainment!